The Rev. William F. "Digger" Dawson, 84, a priest of the Diocese of Davenport, died Tuesday, December 13, 2011 at the Clarissa C. Cook Hospice House, Bettendorf. He was surrounded by loved ones at the time of his passing. Funeral services and Mass of Christian Burial will be 1:30 p.m. Friday, December 16, 2011 at Christ the King Chapel on the campus of St. Ambrose University, 518 W. Locust Street, Davenport, Iowa. Burial will be in the Priest Circle at Mt. Calvary Cemetery, Davenport. Visitation will be at Christ the King Chapel Thursday, December 15, 2011, from 3:00 until 6:00 p.m. There will be a Vigil for the Deceased service offered Thursday at 6:00 p.m. to conclude the visitation. There will also be additional visitation at the church Friday from 12:30 until 1:15 p.m. The Halligan – McCabe – DeVries Funeral Home has been entrusted with Fr. Dawson's arrangements. William Francis Dawson was born October 25, 1927 in Ottumwa, Iowa the youngest of eight children born to William Edward and Genevieve Elizabeth "Jennie" (Larson) Dawson. He attended St. Mary's Catholic School and Catholic Central High in Ottumwa. He graduated from St. Ambrose in 1950. He attended St. Paul Seminary, St. Paul, MN. and received his Master of Arts in History. He was ordained June 4, 1954 at Sacred Heart Cathedral. He also received a Doctorate in Philosophy at University of Notre Dame. He was originally assigned to St. Patrick's Catholic Parish, Iowa City. He then taught at St. Ambrose Academy and at Assumption High School before returning to St. Ambrose to teach philosophy in 1961. Father "Digger" Dawson was the student chaplain from 1968 to 1974 and earned his first Professor of the Year award in 1968, with three others following in 1970, 1988 and 1991. In 1981, Father Dawson also began serving as associate pastor at St. Anthony's Church in Davenport. Throughout his years of teaching, Father Dawson was a true advocate of social justice and peace through his writings, debates and oratory. He helped form Ambrosians for Peace and Justice in 1985 to focus on Central American issues, nuclear war and hunger. In 1997 the Rev. William Dawson Social Justice Award was established in recognition of his commitment to social and economic justice and the promotion and advancement of human rights. 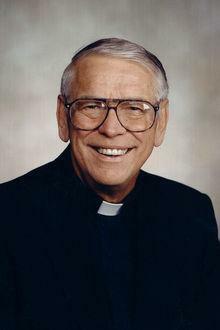 Father Dawson retired from St. Ambrose University in June 2005 after more than 40 years as a professor of philosophy. In 2006, St. Ambrose awarded him the Social Justice Award, established in his name nine years earlier, and in 2011, the McMullen award in recognition of his embodiment of the university's mission. In his retirement, Father Dawson stayed active within the SAU community and continued his ministry at the parish of St. Anthony's Catholic Church, downtown Davenport. He celebrated the 55th anniversary of his ordination on June 5, 2009. In lieu of flowers memorials can be made to the Peace and Justice Center at St. Ambrose University. Those left to honor Fr. Dawson's memory include his lifelong friend and fellow educator, Patricia Kennedy, Davenport; and nieces and nephews, Mary Kay (Bill) Rhomberg, Dubuque, Iowa, Pat (Austin) Wilbanks, Des Moines, Iowa, Tim Sheehan, Rockford, Illinois, Catherine Moyer, Ottumwa, and Larry (Mary Ann) Dawson, Tucson, Arizona.